scalping, intraday trading, grid. Indicators and candlestick analysis are used as inputs. 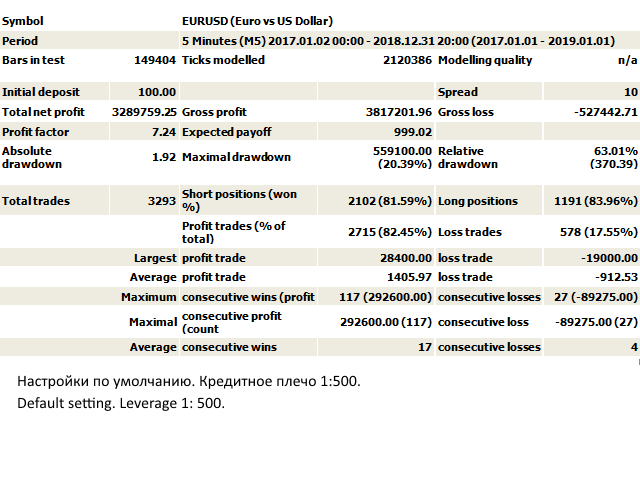 Autocalculation of input volume, profit level in money. Closing positions at the opposite signal. Several types of use of the level of unprofitability (stop loss). Trading in a given period of time. Closing positions and orders on time every day. You can use the grid trading strategy. There is a trailing and closing positions in terms of money. Regeneration mode in case of loss. false - reverse is not used. Start Time Frames - the time period for calculating the input signal EA. Start order interval - the time period to accommodate the starting positions. One start order - true / false. The magic number - the adviser's identification number. Allowed to open orders - the type of positions allowed to open by the input signal. Equity per lot - estimated amount of equity for 1 lot of volume. Start lot (volume) - starting lot (volume). Maximum multiplier of the starting lot - the maximum multiplier of the starting lot. Start lot MAX (volume) - the maximum allowed starting lot (volume). The maximum allowed spread - the maximum allowed spread. StopLoss ... N previous day - the number of previous days. TakeProfit Number - the number in points. TakeProfitGrid - profit level when using the grid. Maximum Grid lot - the maximum volume of the grid order to be set. MartinGrid - is a positive number. TF strategy # 1 - is the time period for the algorithm. NumberDrawdown - the size of a given drawdown in percent. Set the closing minutes - minute. If you have any questions or have ideas on how to improve this advisor, do not hesitate to contact us . The results and settings of the strategy tester are here. I wake up everyday to consistent profits from this EA. It has exceeded my expectations. I'm very happy with it. Keep up the good work Oleg. Looking forward to new things from you. closing only profitable trades when the signal changes.